One of the things I look forward to every spring are tulips. If you do not like greens, tulips have the crunch of lettuce or spinach without the green taste. They are mild, with almost no taste at all, but are very pleasant to eat. Best yet, they come in all kinds of colors and can be used as "cups" for deserts as well as thrown into salads for color. I've been picking tulips around town after they've been blooming for a couple of days and are about to drop their petals. They're still good, although a little beat up, and people just don't think of eating them. What a waste! However, do NOT eat tulips bought in the store or flower shop, they might have been heavily sprayed and beware of picking them "in the wild" where there is high auto traffic or you know people have sprayed. Although in the onion family, tulips do not give gas. Their bulbs are edible, but only just so, slimy when cooked and not very palatable. But the flowers are a cook's dream! And kids love them, too! 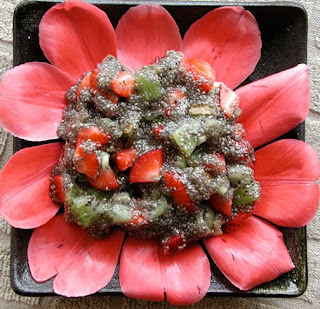 Here is a fun chia fruit salad. plopped on a "flower" of tulips petals. Cut off the part that might have pollen on it.